Albert Pujols has a unique opportunity to not only change the economics of baseball, but also to set an example of restraint for all wealthy individuals. Pujols is considered the best player in baseball. He is the only player in the history of the game who has hit over .300, smacked over 30 homers, and driven in more than 100 runs in each of his first ten years. No one else has come close. Pujols’ numbers do not just hover around these milestones, they surpass them by eye-popping margins. The Cardinals have exercised an option that obliges Pujols to play for them in 2011. Wisely, team management is taking steps to negotiate what might be a lifetime contract with Pujols this off-season. If they don’t, he would hit the open market of free agency following the 2011 year. For nearly 70 years, the symbol of Cardinal baseball has been Stan (the Man) Musial. Pujols and Musial have much in common: excellence on the field, leadership, a calm demeanor, fan friendliness, and a commitment to both charity and social justice. When the Cardinal roster integrated in 1954, Musial established a bond with African-American players. He joined them in pressuring team ownership to insist on housing the team in integrated housing in spring training. Pujols’ charitable activities have addressed numerous needs in St. Louis as well as his home country, the Dominican Republic. On the justice front, he has expressed his unhappiness with next year’s All-Star Game being in Arizona, the state with the most restrictive immigration law in the union. There has been speculation that he might lead a boycott of the game by Latin American players. Players have considerably more power in the modern age, in large part because in 1969, Curt Flood, a former teammate of Musial, refused a trade to the Philadelphia Phillies. He said that he did not want to be a “well-paid slave” who did not have the freedom to bargain with teams of his choice. It is this very right that gives Pujols leverage in negotiations with the Cardinals. Musial played in the era of the “reserve clause” where teams had the power to renew or trade a player’s contract throughout his career. Pujols has made over $100 million in the first decade of his career. Now, the bar has been raised: St. Louisan Ryan Howard, who plays for the Philadelphia Phillies, is making $25 million per year. The Cardinals would be fortunate if they could sign Pujols at that rate for what is expected to be the remaining ten or so years of his career. That would put Pujols’ lifetime earnings in baseball in excess of $300 million. In contrast, Musial made only $1.26 million – total – during his 22-year career. 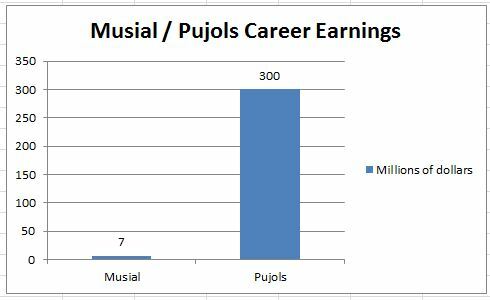 If Musial’s salaries were adjusted for inflation, they would be around $7 million;, slightly more than 2% of Pujols’ projected earnings. The leverage that Curt Flood gave Albert Pujols and all modern players in maximizing their earning powers did not come without a cost. He did more for the players’ union than any other individual. A strong union can guarantee high salaries, so long as it has exclusive bargaining rights and its members do not try to undercut one another. Let’s suppose that Albert Pujols agreed to play the balance of his career at $10 million per annum. He could justify this by saying that no one needs more than $10 million per year, and it is still a king’s ransom to someone who grew up poor in the Dominican Republic. He might also add that winning is an important value to him, and that by lowering the proportion of the Cardinals payroll than he consumes the more money the team has to sign other quality players. But there are problems with the $10 million solution. First, the terms of his 2011 contract guarantee that he will receive a salary of over $14 million. The maximum annual salary reduction that a team can impose on a player is 20%. If Pujols took a 20% cut, he would still be making $11,200,000. To get down to $10 million, he would have to wait until 2013; the maximum reduction over a two year period is 30%, and that would take him to $9.8 million. There are 600 players who are active in the Major Leagues at any time during the season. Surely one or several of them have generous bones in their bodies. So why is it that no player has said “enough is enough;” I don’t need a high salary; others in our society need the money more than I? The primary reason this doesn’t happen is loyalty to one’s brethren. Any player who voluntarily takes a pay cut is (a) lowering the mean salary for players, and (b) giving greedy owners the wedge of telling players that they will not be re-signed unless they “take one for the team;” not just the baseball team, but all of us in society who need the money more than the players do. However, history and common sense tell us that whatever additional salary a player is not paid will go into the owners’ pockets; not for the general populace, even in the form of reduced ticket prices. It is a sad situation when it becomes virtually impossible for a player of Albert Pujols’ integrity to voluntarily take a pay reduction as a monetary and symbolic gesture of expressing his belief that he has enough money and others need it more. He would be a pariah among his peers; a “do-gooder” who would be doing harm to the financial well-being of his peers because he would be lowering the salary bar. So let’s be as realistic as we can. If Pujols signed a ten-year contract at an average salary of $15 – $18 million, he would be receiving a raise, but far less than he could receive on the open market. His actions would not be those of Robin Hood, but they would represent an effort to exercise some restraint in spiraling salaries. Some very wealthy individuals in our society, such as Bill Gates, Warren Buffett, and Ted Turner, are giving enormous amounts to philanthropic causes. You might be surprised to learn that, not long ago, Donald Trump proposed a 40% tax on the rich to wipe out our national debt (the figure would be much higher now). So, suppose that Albert Pujols joined with other high-profile athletes and entertainers to say there is a certain obscenity to excessive salaries at a time when more than a fifth of the American people are out of work or under-employed, and that number is much greater in developing countries.